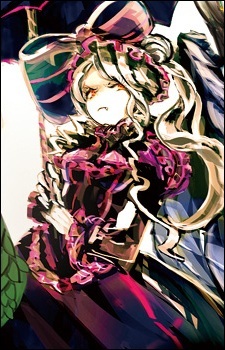 Shalltear is a true vampire and the Floor Guardian of the first to third floors in the Great Tomb of Nazarick. She was created by Peroroncino. Shalltear has a very flirtatious personality and is very open with her sexual preferences, often to other characters' discomfort. Despite her apparent shamelessness, she can be quite innocent about certain things. She has a complex about her small figure, which she attempts to cover up by using breast pads. As a true vampire, Shalltear is extremely proud and takes her position as a Floor Guardian very seriously. She has no patience for failure and will often burst into fits of rage at signs of an unfavorable situation. She will not hesitate to kill any servant who disappoints her; however, she will not punish others for failing in tasks that are impossible to begin with. Shalltear is completely loyal to Momonga and is also a love rival to Albedo for his affections. She takes great joy in being able to prove her worth and fantasizes about the praise she expects to receive. When a situation doesn't go in her favor, she panics about the scolding she believes that she will get.